Watching the situation in Zimbabwe we couldn't help wondering about Robert Mugabe's mustache. 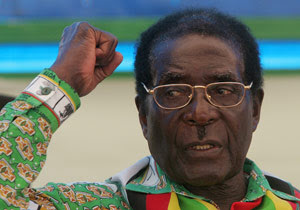 Look at the picture below  if you are not familiar with Mr. Mugabe's face. Seriously: It is election time in Zimbabwe, where he must campaign for the Presidential election run-off (at least that is the latest we read when we wrote this piece). At least you would try to appear likable, wouldn't you? Such iconic mustache reminds us of two people in history: One is of course Adolf Hitler. And although Mr Mugabe has been labeled a dictator by many, we can't be sure if he thinks of 'Mein Kampf' when he shaves in the morning, carefully trimming the edges. But then again, there is no way Mr. Mugabe was not aware that such style would resemble the little man. Unless of course he is thinking of the second person in history who had such style: That person would be Charlie Chaplin . 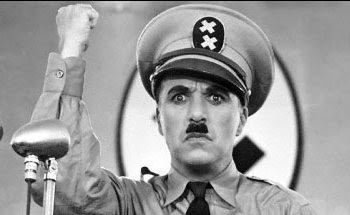 The comedy king of the silent movie era. But we don't think Mr. Mugabe is trying to be funny. The NAZI party is making their way to Zimbabwe. Hey, I think Suharto had a mustache just like that. No kidding and not funny. As far as we can remember, Suharto was always clean-shaven and never had a mustache. And the now jailed Gogon! Suharto's crafty use of makeup and magic prevented people from seeing his real un-shaven upper lip. That's a good one, Rob. We should have included Gogon. Haa ! ^ gogon was jailed? since when?? we don't really remember, but he was involved in some drug-related case a while back. Probably easier to just google him.